A ceremonial bloody bull, a Smithwick’s northern Great Plains beer back, and a salty anchovy snack just 10″ to my left. The following is a morally decent sacrament for St. Patrick’s Day this March 17, 2013. The drink combination is Irish and English in origin, but has northern Great Plains-inspiration. 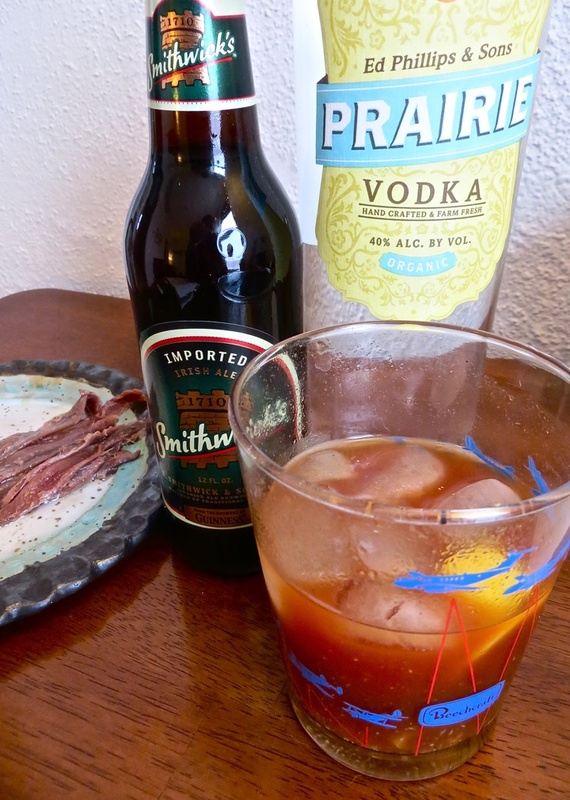 Some years ago I was made aware of the Bloody Bull, or what some folks call the Bull Shot (The New York Times has the former Ben Benson’s Steakhouse Bloody Bull recipe linked to here). For the bloody bull pictured: into the glass goes, approximately, 1.5 ounces of tomato juice, 1.5 ounces of vodka (Ed Phillips & Sons Prairie spirits from Benson, Minnesota), and about 2 ounces of beef broth. Then a dose or two of Lea and Perrins Worcestershire sauce, a couple dashes of Tabasco sauce, a couple lemon wedges, and some ground pepper. The linked to recipes I found insisted on “Campbell’s double-strength beef broth.” But Nash Brother’s Trading Company broth was on sale, so I added that. To substitute the Campbell’s sodium content, I added just a sprinkle or two of Himalayan Pink sea salt. Also note the Smithwick’s Irish Ale. At least in Minnesota and North Dakota, we refer to this as a “beer back.” When someone puts a beer back in front of you, it is unnecessary to question it, or its origins. Were I writing from the Otto von Bismarck, North Dakota on St. Patrick’s Day, I would have purchased a growler of Laughing Sun’s Irish Red Lager, especially brewed for today. But we sometimes just have to grin and bear it, and take what we can get. Also pictured are King Oscar’s anchovies. These are a good salty snack, and when company is around, you rarely need to concern yourself about having to ever replenish the plate. Anyhow, back to it on this end. And Happy St. Patrick’s Day from the northern Great Plains. This entry was posted on Sunday, March 17th, 2013 at 6:02 pm	and tagged with Bloody Bull, Drink, Food, Minnesota, North Dakota and posted in Uncategorized. You can follow any responses to this entry through the RSS 2.0 feed.